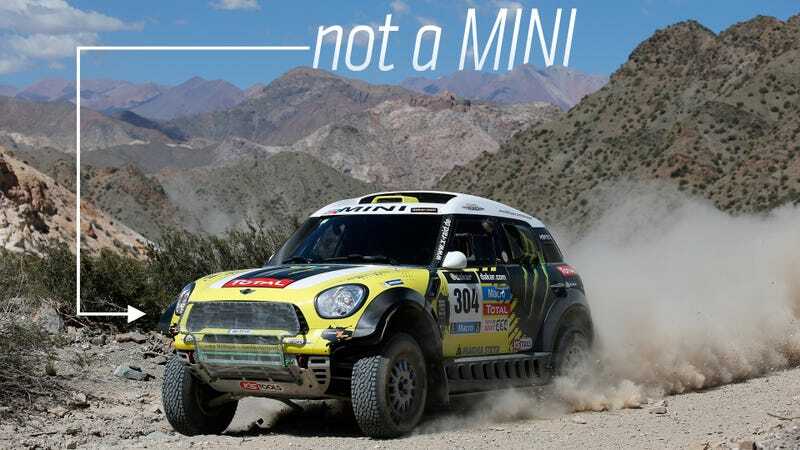 There's been a lot of publicity about Mini winning the 2014 Dakar. Well, the cars that placed first, second, and third have about as much to do with Mini as I have to do with a cheese danish. What Mini calls a Countryman is actually a custom tube-frame special built by two German companies: X-Raid and Heggemann Autosport. Heggemann makes the tube-frame chassis and X-Raid fills in everything else. The engine is a 3.0 liter BMW diesel straight six, an engine you will not find in any Mini showroom anywhere in the world. The clutch and brakes are from AP Racing and the differential comes from Xtrac. None of this stuff is secret — Car and Driver gave a full breakdown of these amazing offroaders last year and X-Raid details everything on their own website. And this should be familiar to any long-time fan of the Dakar, as these Minis were campaigned a few years back as BMW X3s. The main difference now is that the corporate overlords signing the checks at BMW group decided the bodywork should be changed to look like a Mini. If you want to find a Mini Countryman that actually races in the dirt, go look to Mini's aborted factory WRC program. And call the Dakar winners what they are: X-Raids.